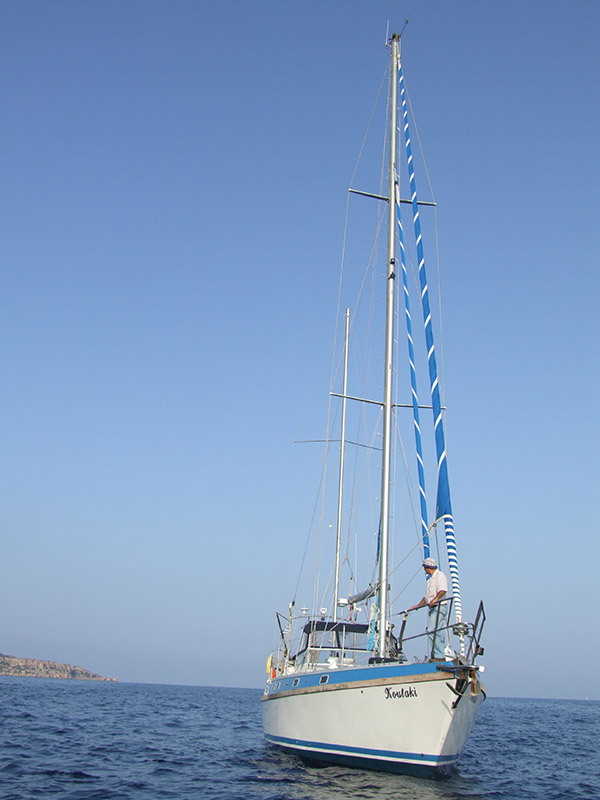 We welcome you on Sailing yacht “Koulaki”, the best equipped and seaworthy Colvic Victor 50 on the sea today. Are you dreaming about sailing and have no licence or enough sailing skills or you just need a guide? 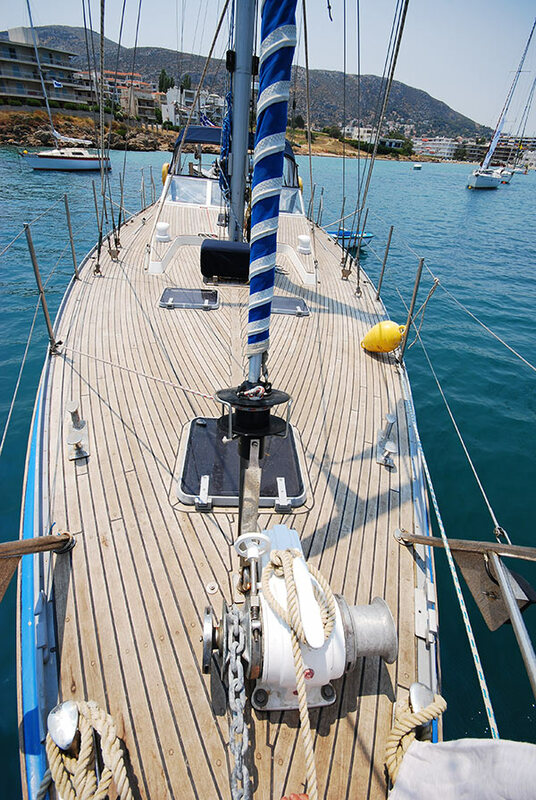 Then choosing our skippered sailing yacht gives you the opportunity for a safe and comfortable journey on the crystal clearAegean Sea waters. There is no better way to uncover the secret beauties of the Aegean archipelago than sailing in the comfort of a skippered sailing boat. You will get unique experiences that no other way of travelling can offer to you: Sailing, swimming, fishing, or staying over night in authentic and unspoiled places where organized tourism has not yet put a foot on. Furthermore an experienced skipper may always give you the best tips of what to visit, where to overnight, where to eat or shop and help you to get the best out of your journey. “Koulaki” is a 16.60m classic sailing boat, originally built in England and lately totally refitted by its owner and maintained in an immaculate condition. Its deep hull and central cockpit makes it really spacey and comfortable. It has four cabins with private wc-shower and one of them interconnects with a two bunk beds cabin sharing the same bath, ideal for family or friends. The fact that Koulaki was rebuilt by its current owner Antoni Lakio with the aim to satisfy his personal interest and big love for the sea and not just for commercial use, makes it very special and definitely worth your visit. Our base, Ikaria, is theIsland of Dionysus, Ikaros & Dedalos, thermal therapeutic springs, and lately discovered as a longevity paradise. It is strategically located between the most interesting and popular groups of Greek islands the Cyclades islands (Mykonos, Paros, Naxos, Santorini ect. which is the most requested rout for our gests), the islands of Dodecanese (Patmos, leros kos, Rodos etc.) and of course Ikaria, Fourni and Samos islands. Besides the popular Greek destinations there are plenty less known islands inhabited or uninhabited waiting for you to explore their secrets. What ever route you decide to take you could combine sailing from cosmopolitan famous islands to hidden and remote gulfs with crystal clear waters and picture some fisherman’s villages. For example on the Cyclades route there are Folegandros, Koufonissi, Schinoussa, Donousa, on Dodecanesa rout you may visit Arki, Lipsi, Leros, and on the way from Ikaria to Samos the Fourni Islands where pirates used to hide or the Agathonisi. The Saronic gulf and the coastline of Peloponnesusis an other choice for the ones who want a milder sailing experience in terms of winds. We are flexible with our itineraries and always try to make your dream vacation come true. Depending on our bookings you can choose to start your charter from Mykonos or Santorini, Lavrio (Athens), Ikaria or Samos. Of course the sooner you book the better, since it this gives you more choices of where to start and finish your sailing trip. We are the owners of S/Y Koulaki. We are not a big brokerage company but a family active in tourism and sailing for the past 25 years and are based on the island Ikaria. We provide a carefully selected multi-lingual, talented, knowledgeable and friendly crew on S/Y Koulaki that ensures that you have a wonderful sailing holiday onboard. You will feel secure under sail or motor since “Koulaki” is the most stable boat in its category due to v-shaped hull & semi – long keel. You will feel very special stepping in “Koulaki” and looking its classy and spacey interior with the wooden floors, the solid mahogany walls, doors & furniture, fully equipped with all the comforts you may wish, like air-condition, TV, DVD, Speakers, Electrical push button toilets, hot water etc. You will have your best sleep in its en suite cabins with first class mattresses. You will feel like home preparing your meals using its large well equipped kitchen or using its large mahogany dinning table. You will have plenty of space on its wide open tick decks and its central cockpit for sunbathing or relaxing. Our personal interest to maintain S/Y Koulaki at the highest standards is the best guarantee for our clients.